A determined police officer revisits a case that’s long haunted him. The battered remnant of the flower of English youth is returning from the horrors of World War I. Herbert Reardon, badly burned in the war, is not sure whether he can return to his former job as a police officer. Before he makes any decisions, he goes back to Broughton Underhill, the site of his last prewar case. Marianne, the oldest of the lovely daughters of the Reverend Francis Wentworth, was found drowned in the ruins of a rickety dock. The death was written off as an accident, but Reardon has always had his doubts. After the death of his wife and the loss of his faith, Reverend Wentworth accepted the offer of a home, a dismal rectory, from Lady Sybil, his wife’s cousin. His private income covered his son William’s school fees, and his daughters shared the governess of Lady Sybil’s daughter Eunice, whose brother Greville was also away at school. 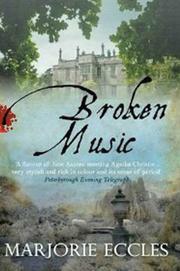 Not long after Reardon reopens his inquiries, Lady Sybil’s maid is found murdered. Reardon, who’s been offered his job back at the rank of Inspector, is given the case. Careful questioning reveals that the placid surface of prewar life in Broughton Underhill conceals a number of dangerous undercurrents that may have led to Marianne’s death and the murder of the maid. The latest in Eccles’ long string of period English mysteries (The Cuckoo’s Child, 2011, etc.) offers a gaggle of murder suspects along with a melancholy look at the period just after the war to end all wars.